Las Trincheras is a Thermal Center & Spa, is located two hours and a half drive from Caracas, and just 15 minutes from Valencia in a leafy gully. The air is pure and rich in iodine, influenced by the sea winds blowing from the nearby coast. 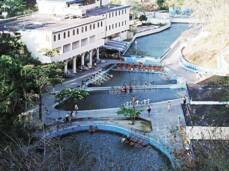 Visited by Alexander von Humboldt in 1800, the thermal center was officially founded 89 years later. There is a hotel that has 120 simple rooms, ranging from standard to executive suites, restaurant, cafeteria, TV room, meeting rooms, laundry, telephone, post office and medical service. 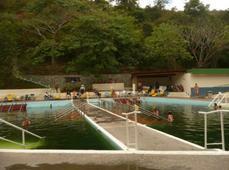 There you will be amazed by the pure and crystalline hot springs reaching up to 194ºF. The revitalizing natural waters are especially recommended for painful joints, chronic rheumatism and neurological disorders. Rich in mineral content, the waters have bicarbonate, sodium, fluorides and silicate, elements that make them unique in the world. The treatments used in Las Trincheras are thermo therapy (pool baths), swedish baths (hydrotherapy), natural steam therapy and mud therapy. If you want to stay there longer, we can book a hotel room there. The hotel has 120 simple rooms, ranging from standard to executive suites, restaurant, cafeteria, TV room, meeting rooms, laundry, telephone, post office and medical service. Taxi driver will pick you up at your hotel, drive for about 2 1/5 hours, leave you at Las Trincheras Thermal Center & Spa and then pick you up at a desired pick up time.